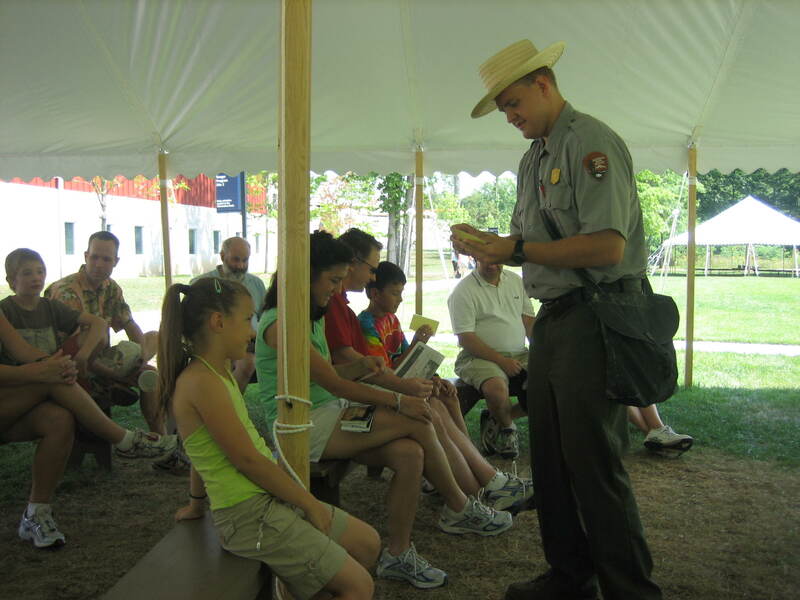 “Doctor” and National Park Service Seasonal Ranger Jim Flook performs an “operation” on a visitor at Gettysburg National Military Park. Flook is playing the role of the Chief Surgeon, while his assistant surgeons on either end of the table are helping him with an amputation. This view was taken from the northeast facing southwest at approximately 3:30 PM on Sunday, August 3, 2008. 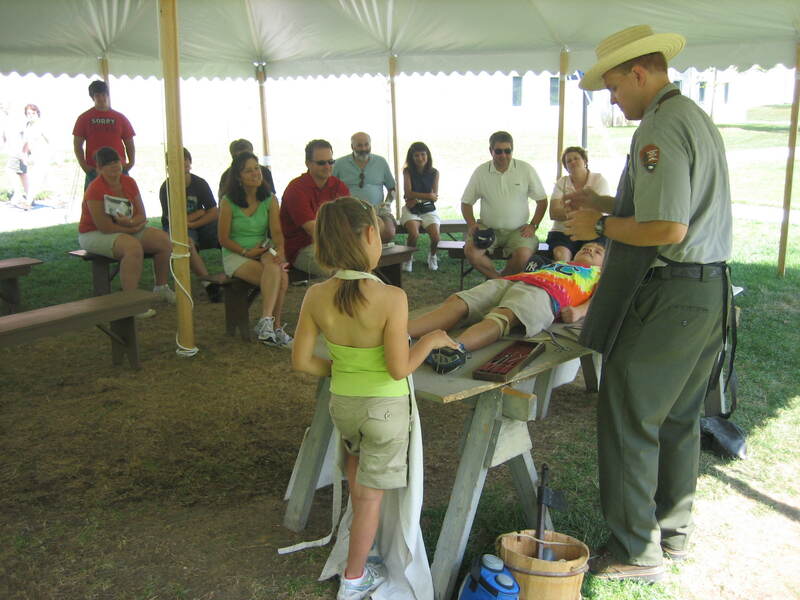 Civil War medicine is a free program presented by the National Park Service to Visitors at Gettysburg National Military Park. 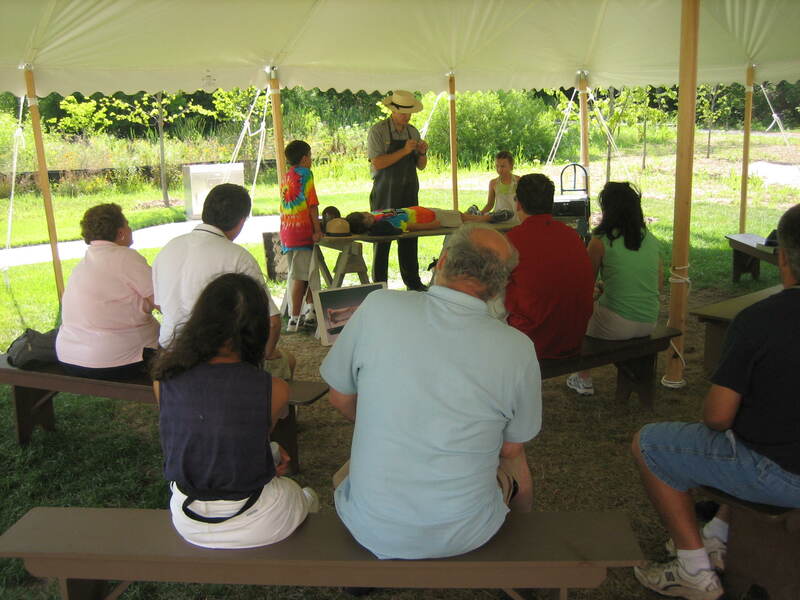 Seasonal Ranger Jim Flook presented the program at Ranger Program Site #2 west of the Visitor Center. 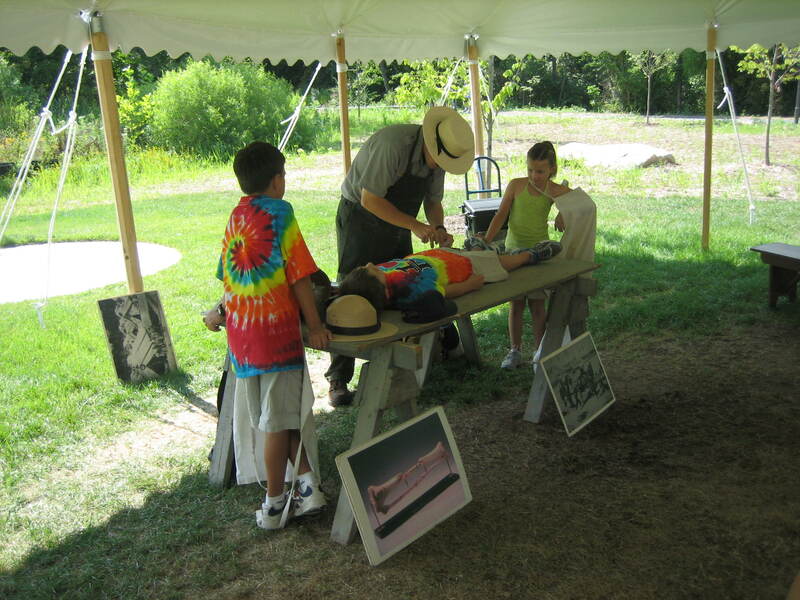 His program involved explaining the status of Civil War medicine and audience participation. We previously featured Jim when he presented his Kershaw Brigade Walk on July 15, 2008. 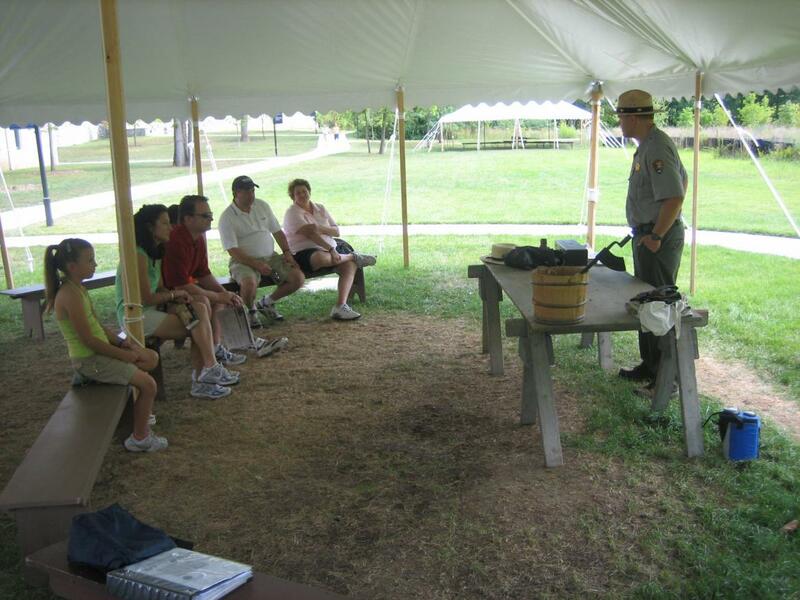 Seasonal Ranger Jim Flook presents an introduction to his program on Civil War medicine. This view was taken from the northeast facing southwest at approximately 3:30 PM on Sunday, August 3, 2008. Jim first explained that many surgeons did not have formal medical training. Some of the training that they received was attending two years of lectures. Many of them had never seen the inside of a human body as cutting cadavres open had been outlawed in many areas. This view was taken from the north facing south at approximately 3:30 PM on Sunday, August 3, 2008. Surgeons were appointed by governors, and becoming an army surgeon could be a good position as Jim explains in this video. The United States Army had approximately 600 surgeons at Gettysburg, and the Confederates had approximately 400 Surgeons. This view was taken from the northeast facing southwest at approximately 3:30 PM on Sunday, August 3, 2008. Jim handed out cards to which listed different symptoms to visitors. He would ask the visitor to read the card, and he would give the best explanation at that time of what ailment the visitor might have been suffering. He would also prescribe a “cure.” This view was taken from the north facing south at approximately 3:30 PM on Sunday, August 3, 2008. For one of the visitors who received a card, it was decided that he would have to have surgery. He was brought up to the operating table at the aid station. This view was taken from the northeast facing southwest at approximately 3:30 PM on Sunday, August 3, 2008. Two assistant surgeon’s were called up (the patient’s brother and sister) and an explanation about keeping the patient sedated was given. This view was taken from the southeast facing northwest at approximately 3:30 PM on Sunday, August 3, 2008. The surgeon performs a preliminary examination to see exactly what kind of wound it was. This view was taken from the northeast facing southwest at approximately 3:30 PM on Sunday, August 3, 2008. He needs to determine what type of incision is needed, and exactly where the bullet or round is. This view was taken from the northeast facing southwest at approximately 3:30 PM on Sunday, August 3, 2008. 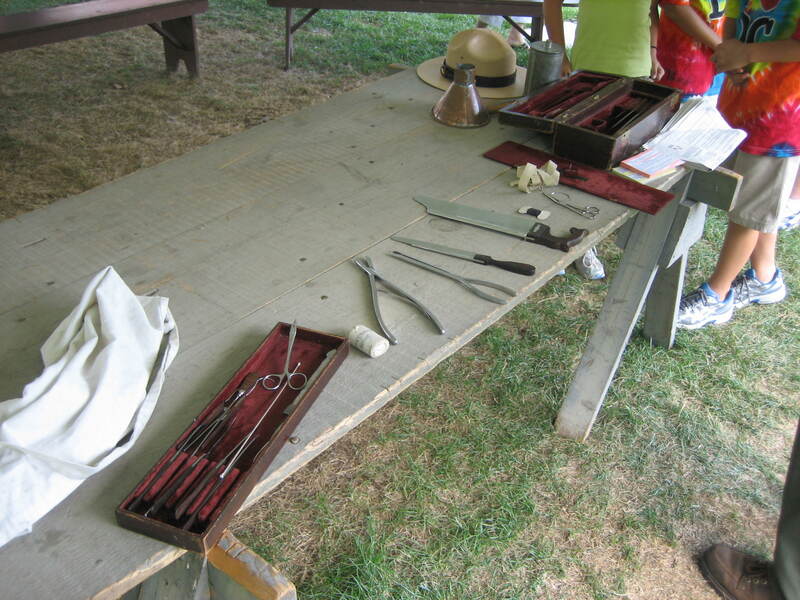 There were few hospitals performing surgeries in the United States before the Civil War. Massachusetts General Hospital performed only 200 a year. That many surgeries would be performed daily at Gettysburg in the days following the battle. This view was taken from the northwest facing southeast at approximately 3:30 PM on Sunday, August 3, 2008. As germs would not be discovered until the 1870s, the Chief Surgeon and his assistants did not wash their hands before or during the operation. This view was taken from the southeast facing northwest at approximately 3:30 PM on Sunday, August 3, 2008. The leg is “amputated.” This view was taken from the northeast facing southwest at approximately 3:30 PM on Sunday, August 3, 2008. Overall, however, Americans performed their surgeries well. 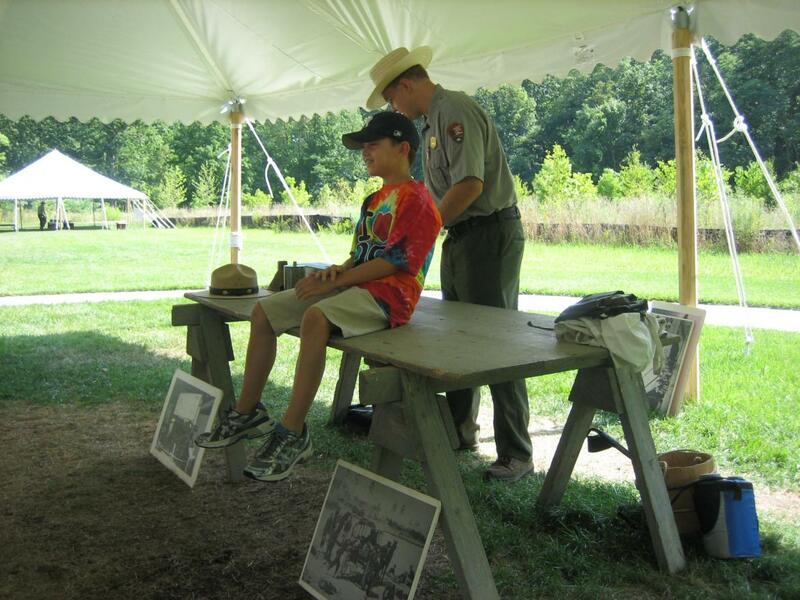 Those soldiers who experienced operations during the American Civil War had a survival rate of 73%. In the Franco-Prussian War in the 1870s, the survival rate was only 26%. This view was taken from the southeast facing northwest at approximately 3:30 PM on Sunday, August 3, 2008. Here are some tools from the surgeon’s kit. This view was taken from the northwest facing southeast at approximately 3:30 PM on Sunday, August 3, 2008. Joe explained that the “Letterman System” adopted by the United States Army during the Civil War was used through the Vietname War. 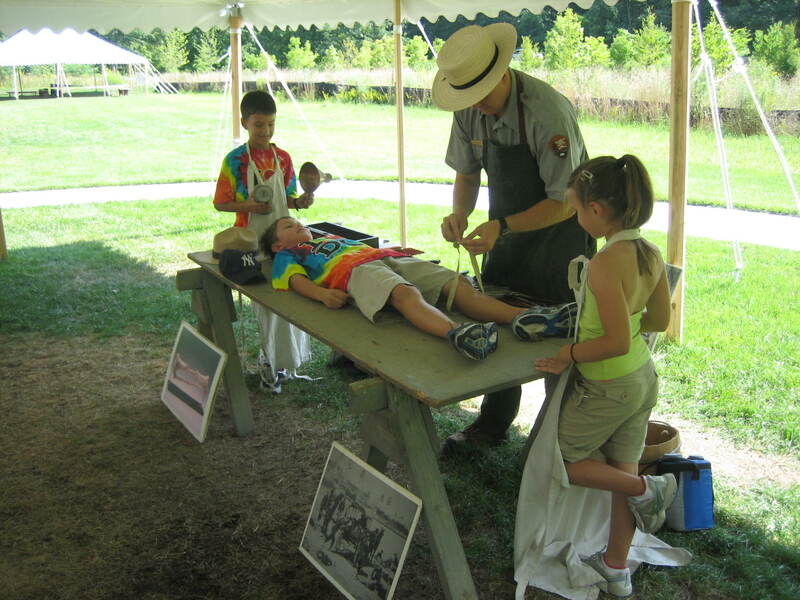 In this video clip he explains some benefits of the trial and error of Civil War medicine. This view was taken from the northeast facing southwest at approximately 3:30 PM on Sunday, August 3, 2008. The goal of the Gettysburg Daily is to present at least one picture a day taken at Gettysburg on that day. The previous pictures we posted for today were taken Sunday, but were not used because we featured the reenactor shooting. 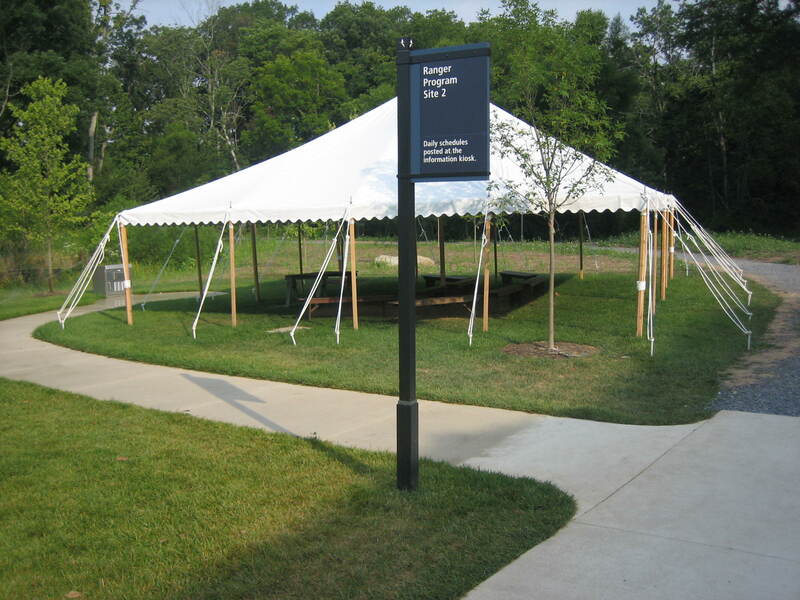 Therefore, in order to keep up our streak, here is today’s picture, a picture of the tent where Joe Flook performed his operation on Sunday afternoon. This view was taken from the southeast facing northwest at approximately 7:30 AM on Tuesday, August 5, 2008.